I have been waiting for this day for a very long time, my friends. I have been stalking our fellow poet and witchy woman, Magaly Guerrero, for a considerable time, hoping to feature her for your delight. And now here we are! Yay! You likely have encountered Magaly at her two blogs, Magaly Guerrero (Dark Fiction. Dark poetry. Balanced witchy living), and Magaly Guerrero's Pagan Culture, or at our sister site, Imaginary Garden With Real Toads, where she links up regularly. Draw your chairs in close. There be spirits here. Our tea may be steeped with a little of Magaly's magic potion, and don't be surprised if you overhear an incantation or two. When two witchy women get together, anything can happen. For certain, there will be cackling! Sherry: Magaly, yippee! Here we finally are! Tell us where on the planet you make your home, and what is wonderful about it? Magaly: I live in New York City, with a Piano Man, a Little Princess, and an urban garden that always threatens to take over our apartment… especially when the Wheel of the Year turns towards the cooler months. I’m minutes from Manhattan and right across the street from an enormous park. This is perfect, since I would lose my wits without a healthy amount of forest nearby… and horses—which I never, ever, ever feed while their caretakers are not looking *cough*. Sherry: A wonderfully exciting place to live! Tell me, as one who lives vicariously if, indeed, I live at all, do you have a favorite place to go in the Big Apple? Magaly: Actually, Sherry, I don't think I have a favorite place to go in New York. I go wherever the things I like to do are happening: I enjoy readings, book sales, conventions, fresh fruit markets...So you see, not as interesting as you might think. I go to shows my husband is playing or conducting. I enjoy Shakespeare in the Park in summer...But all those things are just things I would do any place I might live. Sherry: It sounds wonderful, and so does your husband. What a talented pair you are! I so enjoyed your recent post about your Piano Man, entitled Finger-Feeding Souls. Do check it out, kids, it is a veritable feast to read! Magaly, I know you as a writer of poetry and prose. When did your journey as a writer begin? And which is your first love? Magaly: My first love is prose. I began writing fiction in my very late twenties. It was sort of an accident. One night, while I was on Active Duty working as a case manager for Marine-4-Life (now the Wounded Warrior Regiment), a nurse came to get me because one of my Marines was having a bad night. His leg had been amputated recently, and the pain medications were not doing a great job. I ran to his room. He was enraged, but not at the pain. After much encouragement (and whispered oaths of secrecy), he told me that he had accidentally ripped the last few pages of the dark urban fantasy romance he had been reading and now couldn’t tell how the story ended. It was after midnight. I couldn’t get a new copy for him. I asked him about the plot. After I got the major points, I went back to my office and wrote an ending. He loved it. The smile on his face filled me with joy. I’ve been writing fiction ever since. Sherry: What a marvelous story! I am so enjoying this conversation. As, of course, I knew I would. What do you love about poetry? Magaly: I love writing poetry for the same reasons I'm crazy about prose: the two take imagination and life, morph them into tales, and birth them safely into the world. For me, words are therapy, problem solvers, rewards... I write stories - shaped as poems and as fiction - to celebrate my happy moments, to release physical pain, to make sense of difficult issues, to soothe emotional hurts, to play... I love reading poetry because a good poem makes me think, and thinking is a really good thing. Sherry: What is that song? "You're so young and I'm so old...." Enjoy that faculty while you can, my friend. I've passed my Best Before date. Cackle. What do you love about blogging? Magaly: My favorite thing about blogging is that it offers a way to form relationships with people I might’ve never met otherwise. And you know what? That’s a gift. Sherry: I completely agree. Would you like to choose three of your poems and tell us about each one? where it would choke in stark, tumultuous grief. when we fight the fog while stuck in place. shouting into my skull, “Take control ruthlessly. clouds of barely submerged apprehension. in dirt, in Faerie, in the resurgence of love, in Self! I am reclaiming my all. glimpsing the spring of a new me. Magaly: I asked friends on Facebook to share 3-word phrases that described their 2015. This word-baby was conceived by their descriptive trios and birthed by my Muse. I had to play around with the phrases a little… But in the end the entire poem was built from bits of my friends and me. And that thought always brings a huge grin to my face. Sherry: What an original method for birthing a poem. How cool. Let's look at your third offering, my friend. which once again, burned the innards of their television. “And women, dammit! Don’t you ever forget women. He had no choice but to attack. so much energy fueling the lashing of his lover’s tongue. You are ardor made art, heart of my heart. wrung raw by all the non-fiction horror in the Five O’Clock News. But neither hurt nor social disenchantment could silence the man he married. He picked up Bradbury and caressed his cracked spine with his trigger finger. “Sun Tzu told me,” he said, flashing the universal conspirators’ grin. Husband met husband in the middle of the living room. With Bradbury and Sun Tzu as witnesses, they kissed. Let’s make love and lightning, not war or ruin. Sherry: I adore this poem, the conversation, the caring and, especially, the closing lines. Best antidote to the news I can think of. Magaly: This was my answer to a prompt that listed 13 words, out of The Art of War, and instructed us to write a poem using some of them. The details of the prompt mentioned current conflicts in Syria, Gaza, the Ukraine… I found myself revisiting news articles on these subjects. I was also rereading The Martian Chronicles, by Ray Bradbury, at the time. This piece is a dance between many of the thoughts the experience left in my mind. Sherry: There is a depth of information and emotion in this poem. I love hearing about the various ways you write poems. No wonder I enjoy reading them so much. I note you have published three books. What would you like to say about Blooming Howls? It looks fantabulous! 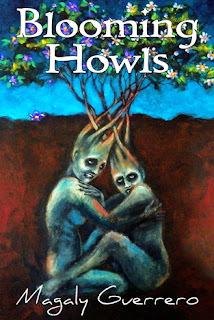 Magaly: Blooming Howls is a very short dark fantasy collection. The “fantabulous!” look you speak of is the artwork of my dear friend, Michelle Kennedy. And it was inspired by a scene that takes place in the first story in the collection. Sherry: May it sell many copies. Is there anything you’d like to say to Poets United? Magaly: I would like to thank everyone, especially you, Sherry, for sharing your words with me and for letting me share mine. Sherry: Thank you, Magaly. I am so pleased I finally had the chance to feature you here. I consider it a scoop! Wasn't this fun, my friends? Every week, another poet who knocks our socks off. What a lot of talent there is online. Do come back and see who we talk to next. Who knows? It might be you! Its wonderful to expand knowing more about you Magaly through this wonderful update :D you're so talented especially when it comes to prose. O Magaly! How have I missed these longer poems and just delighted in your smaller nuggets (more often than not words found in significant texts and made sensual and immediate). I LOVE THESE too. You have collaborative magic. I don't always like the dark world of your fiction, but always like the sensual world of love and overcoming pain that is your poetry. I Love You. Thank you and Sherry, too, for this little interview. One of these days I will spend some time categorizing both my fiction and poetry... and defining "dark" when it comes to my writing. For instance, in my mind, both “On the Wheel of Living and Dying” and “Let’s Make Love and Lightning” discuss rather dark issues: life and death, alienation, war, pain... So they are dark writings--they come from the deepest parts of human nature and interaction. Ah! You don't like dark urban fantasy. Totally get it. Some things are not for everyone. Yes. The topics of your poems above bring me closer to God in some way that I cannot say. I'm not a fan of horror genres of fiction. I like some of deLint, urban fantasy that is not so dark. I'll look forward to What's Next. Yay, Magaly! I am SO HAPPY to finally see you featured here. Only you know how long I have hoped for your wonderful smile to grace this page. Thank you for taking the time, kiddo. Oh, this was a wonderful read! Love darling Magaly! Thank you for this interview, Sherry! Oh, Magaly and Sherry, what a wonderful article! I enjoyed learning a bit more about you, Magaly. Wish I'd known you lived in NYC when I was there last summer. Smiles. The story about writing the end of the book for the injured marine is absolutely wonderful...how kind of you to do that! Interesting the different ways you find inspiration to write. And congratulations on your published books. Thanks so much for sharing your poetry with PU, Magaly, and also for being such a reciprocal poet! And, Sherry, thanks for always finding such unique approaches to bring out the best in a poet! Well, don't forget to wave when you come back to NYC! Brilliant interview!!! I don't know if you mentioned before how you started to write, but I never new how! You were meant to share your wonderful words!! I see my favourite poem was mentioned! Thanks for this interview Sherry! Thanks Magaly! I think I wrote a post about it a couple of years ago, but the story wasn't the focus at the time. Magaly, you are a new talent to my eyes and ears, and I must say, I am enchanted. Oh.My.Goodness! The story of how you began writing...FANTASTIC. A novel in and of itself. "Winter slapped me like a sickness"
New fangirl here. So happy to know more about you. Sherry is just the BEST at that. :) Thank you both. This is so great..Magaly love your work. And Sherry such an interesting interview. Thank you both. LOL.....Hobbling Woman says thank you...I am actually DIZZY, but am happy to have that perceived as rocking. Smiles. Magaly, I'm so happy to have come across your writing. I really like the way we all seem to slip into writing accidentally...each a story and we meet with people that never would have met otherwise. Great interview as usually, Sherry. Likewise, Bjorn. I'm always amazed by writers who say they "were born with a pen in their hands". Most writers I know found themselves being sort of poked into action by said pencil. 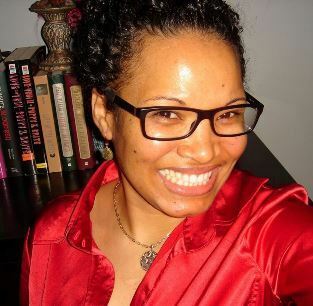 A brilliant interview with one of the wicked and remarkable writers I know! Wonderful interview as always, Sherry, and wonderful words from our witchy woman Magaly. I so enjoyed reading this, and this quote--" For me, words are therapy, problem solvers, rewards... I write stories - shaped as poems and as fiction - to celebrate my happy moments, to release physical pain, to make sense of difficult issues, to soothe emotional hurts, to play... " YES! Thanks so much for brightening our world, you two. I like best, of the poems shared, "Always". I'm a romantic at heart. The life story of how you started writing fiction is so interesting. Luv these bits of light thrown expressed in such interviews here. Your poetry always sings of your romantic nature, and of your bright soul, dear Gillena. How beautiful - Magaly's first writing experience, how giving of herself awakened her talent. I am so impressed by Magaly's writing and her openness. The poems are all so much a part of her depth, her love, her thinking. I am awed. Thank you Sherry for this interview. To me, it's inspirational. I am a big fan of Magaly's brand of witchcraft and wizardry (especially that conjured with her pen). What a wonderful treat...thank you Sherry and Magaly! I love how you started writing, and how you think of poetry, Magaly....'offers a way to form relationships with people I might’ve never met otherwise'....how very true that writing is a wonderful way to connect. I love reading your poems and where they come from....fantabulous and inspiring are but a couple of words that don't do your poems enough justice...thanks for this witchy visit. "Decapitation therapy." I love it! Since I first fell im love with AlmaMia, I have found the sweet/tart succlence of a Mango flavoring nearly every word that has followed. You know I love you. Magaly, i am so heartened, and moved by how you treated that wounded veteran. that must be one of the most memorable ways to start writing. Thank you. It's great knowing you and your words, too. For this one I will come out of my cave of darkness to breathe in the light of this enchanting interview and tell you Magaly you are a very talented writer. It's interesting how events in our lives jumpstart that writing bug. Thanks for sharing and Thank you for your service. I had computer probs for a few days, but glad I can finally enjoy this wonderful interview. Many thanks to you both; it's my new favourite. And oh, what wonderful poems! Hard to pick a favourite of them; I so love all of Magaly's work (as well as her warm, wicked, witchy self).